Home » Events » Student Hub Trivia Quiz! 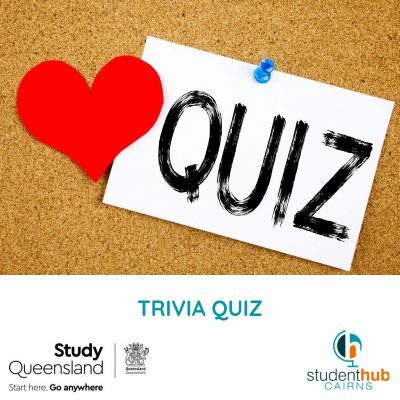 We would like to invite all international students in Cairns to our Student Hub Trivia Quiz! In Australia a Trivia Quiz is a fun afternoon full of general knowledge questions that will help you learn some useful information, meet fellow students and have ! There will be a great for the winner of the Trivia Quiz !!! Snacks and drinks will be provided. This is a FREE event but registration is necessary. Please register your attendance by clicking the REGISTER button below. Feel free to bring a fellow student friend, but we must know numbers so don’t forget to include them in your registration. Meet at the Student Hub. PLEASE ensure you arrive at least 5 mins before scheduled start time!